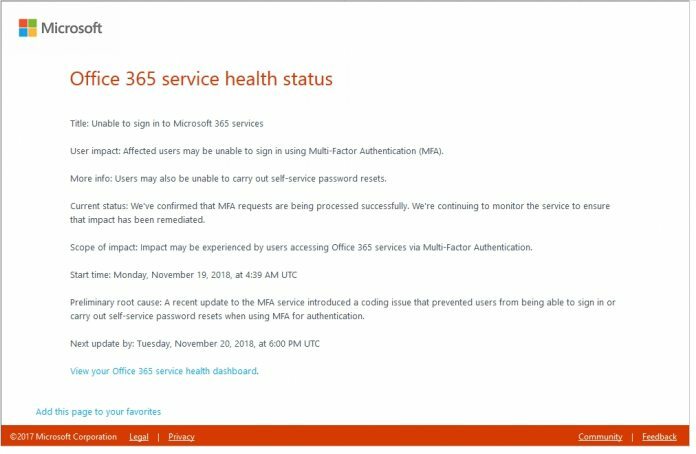 Organizations were unable to sign in to Office 365 and Azure services yesterday due to multi-factor authentication issues. Users of Microsoft cloud solutions were left frustrated yesterday as they were denied access. Organizations have been shut out of Azure and Office 365. Microsoft has confirmed the issue was caused by multi-factor authentication, while password resets were also affected. Additionally, Microsoft says Azure Active Directory (AD) also suffered problems. It seems the outage was relatively long lasting, with complaints still being sent to the company 10 hours after the first reports. “Starting at 04:39 UTC on 19 Nov 2018 customers in Europe, Asia-Pacific and the Americas regions may experience difficulties signing into Azure resources, such as Azure Active Directory, when Multi-Factor Authentication is required by policy,” Microsoft said. The company says engineers have created a hot fix that should prevent most authentication errors. However, some users are reporting the fix caused problems of its own, such as not prompting them to login. This is the second time users have been shut out of Microsoft’s Azure services recently. Although, in September an outage to the service occurred and not a login issue. A problem in the company’s South-Central US center caused Visual Studio Team Services, Azure Active Directory, and Azure Bot Service to be down.